On Thursday I entered what at times felt like a surreal nightmare, though it was punctuated by much loveliness. 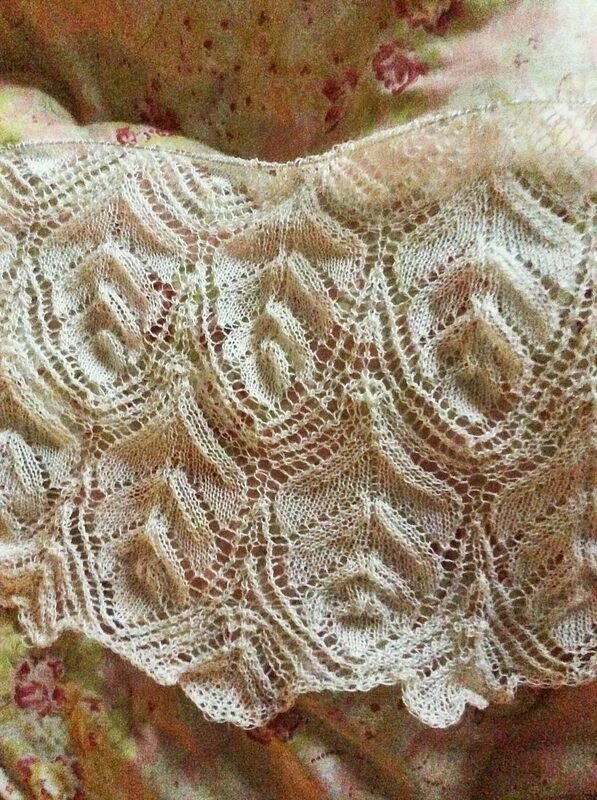 This was not just any knitting, but was the beautiful lace curtain I have been working on since Christmas, ie the product of several hundred hours of work. 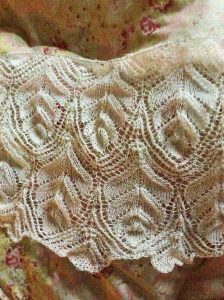 It is based on patterns from the Victorian knitting manuals myself and my sister collect, and knitted in fine cotton thread (Anchor #60) on 1.75mm needles. Losing it was a heavy blow! I’m sure it happened because I was feeling unwell, and despite this had decided to honour my commitment to meet some friends in Leeds for our monthly ‘girls’ coffee’. 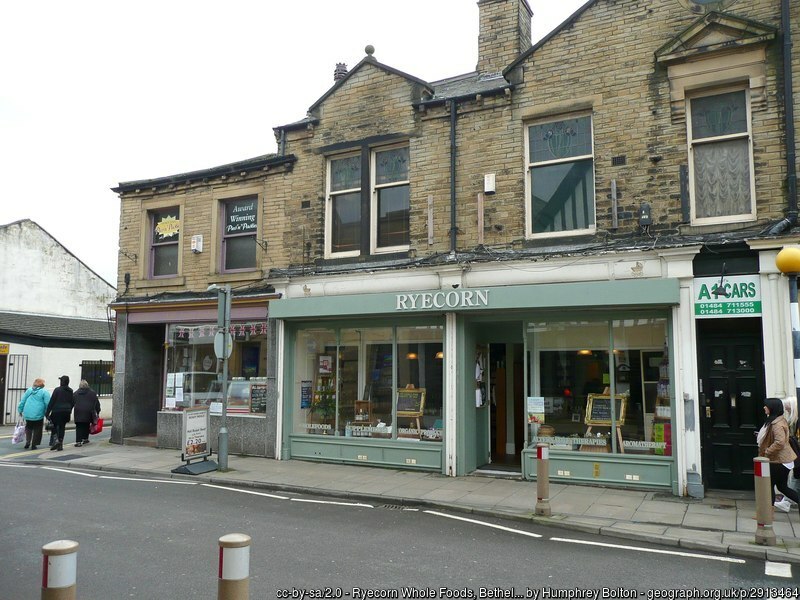 We meet in a Bohemian style coffee shop in Chapel Allerton for chat about how we are each doing with our personal growth, and for mutual support. Despite it being a significant practical challenge to get there, as I currently can’t drive due to some eye problems, it is worth making the effort. Mary had very kindly offered to pick me up from Leeds railway station. Once in her car I told her I was feeling unwell, and she said to let her know if it got any worse, and in that case we would leave girls’ coffee immediately. However, I didn’t at any point feel that was necessary, and we stayed right to the end. I had taken my knitting to show them, because they were involved in my decision to undertake this ambitious project, and have cheered me on with maintaining my focus on it. The return journey from Leeds was far from straightforward. Currently there are major problems with train timetables since they were completely overhauled last month. Northern Rail, the company operating most trains in my area, are particularly affected. With several other passengers I got on the train to Brighouse from platform 12C, and after a long wait we were told the service had been cancelled. Unwilling to risk waiting another hour for the next direct train to Brighouse, operated by the same unreliable company, I checked on my phone for alternative services. If the next train to Lincoln ran, also a Northern service, I could change trains at Wakefield Kirkgate and get the Grand Central to Brighouse. 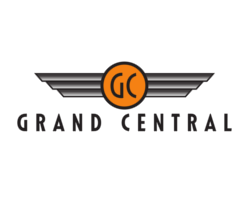 I love Grand Central, which I always use for journeys to London because it is the only direct service from Brighouse to London, and it has wonderfully modern trains, with comfortable seating and sockets for charging phones etc. What’s not to love? So I did it. The change at Wakefield involved a bit of a wait on the platform. Luckily I had bought a sandwich and some biscuits at Boots in Leeds station. I distinctly remember removing my curtain project bag from my handbag at the counter there in order to get my purse out to pay. I also remember removing the project bag from my handbag as I waited for the Grand Central train at Wakefield. I had picked up a newspaper and was rooting for a pen to do the crossword with. The Grand Central train arrived, and I rushed to get on, but there was a mother getting off with a baby in a pram and a toddler wearing safety reins. She got the toddler off first, and with wonderful blind trust handed him to me saying to him, ‘wait here with this lady’, then got back on to get the pram. I grabbed his hand and stood waiting, enjoying the moment as he looked at me somewhat quizzically yet calmly while his Mum struggled with getting the pram. As I handed him back to his Mum she thanked me very sweetly, with clear relief to be safely off the train with her whole entourage. It was a lovely Yorkshire moment, and I got onto the train smiling broadly. It being a Grand Central train I was able to charge my phone, which was now down to just 1% charge. This was very fortunate as school rang me shortly after we left Wakefield to ask for permission to give my middle son some paracetamol because he had developed a nasty earache. Once in Brighouse I walked home from the station. Anyone watching me would have thought I was drunk, as by now I was so unwell that I swayed as I walked, at times losing my step and weaving across the pavement. Nevertheless I popped into Ryecorn Wholefoods to buy some lovely locally baked artesan bread, and for a chat with the friendly owner, John. Then when I arrived home I sat outside for a while, drinking the orange juice I had bought at Boots in Leeds station, before climbing the stairs to bed, which I felt was the best place for me given how tired and nauseous I now felt. Being Thursday it was to be ‘knit night’ that evening, so after a few hours sleep I got up to go to my sister’s house, where we had decided to meet. This was when I discovered I no longer had my knitting. It wasn’t in my bedroom, nor the kitchen, nor outside where I had sat when I arrived home. It must be at John’s (Ryecorn Wholefoods). Alas they were now closed, so I would have to wait until the next day to get it. Besides, I was feeling too ill to worry. The next day I rang Ryecorn, and they couldn’t see my knitting anywhere. This is when I did begin to worry about it. Where was it then? Had I left it on the Grand Central train, or dropped it on the platform at Wakefield, or somewhere on the walk home from Brighouse station? Was I really sure it had been in my bag at Wakefield? Had I left it on the cancelled Northern train, or on the Northern train that got me to Wakefield, or on one of the platforms at Leeds (I had waited at several), or on the counter in Boots? 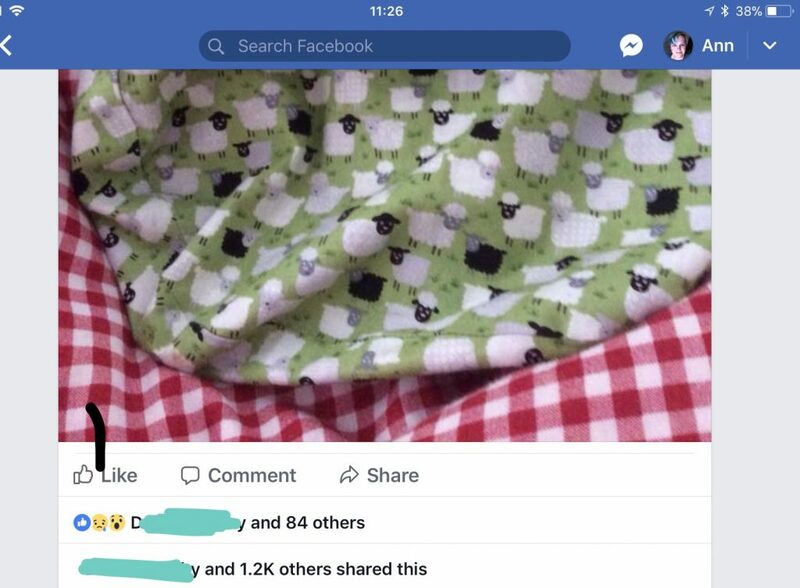 Being a modern internet-savvy lass, as well as contacting train companies and lost property offices, I also put out an appeal on Twitter and Facebook, where I was overwhelmed by the level of concern friends and strangers alike expressed about my loss. Such kindness! Total strangers offered to go into Leeds station to ask about it there, and into their local yarn shops to ask about it there. I even received several offers of commiseration gifts; needles and yarns. People really care! There have been times in my life when I have not been aware of that truth. If ever again I fear that I am insignificant, or that nobody cares, I hope I remember the time I lost my knitting. On Saturday I taught a workshop at Black Sheep Wools near Warrington. My dear sister drove me there and assisted in the workshop. Then we returned to my house for a quick bite to eat before going out for the evening. I quickly checked my phone, and found a message from my dear friend Mary; ‘I have your beautiful curtain, and will post it back to you’! At first reading this I felt completely divorced from reality, then I shouted the news to Marie. She ran in from the kitchen and we hugged, then she danced me around the lounge with joy! It is now apparent that I left my knitting project bag in Mary’s car when she dropped me off at Leeds station after girls’ coffee. All the memories I have of seeing my project bag after that are false ones! So it’s a happy ending, and in fact it’s a happy beginning and a happy middle too. People are kind, and life is good! Just goes to show you, you can’t trust your brain when you are sick. Hope you are getting much better and so glad the curtain was found! Aw Ann so pleased to hear your knitting will be coming home to you. Just goes to show how the brain can trick us into believing all kinds of things. There are so many kind caring people out there. It is only in times like what happened to you do we realize it.